Data can now be archived to an external database using a separate connection string. Provides a way to reduce the primary database size by moving data to a separate database. Optimized search of normalized phone tables for search of large data sets. In kiosk mode, survey is restarted after competition. This was designed for lead generation at a conference. New lead, contact or target records can be created from the survey submission. A new SplendidCRM Survey App was specifically designed for online or offline lead generation. Survey Question Sample during design makes it easier to visualize survey. Manage data privacy requests in order to support the European Union General Data Protection Regulation (GDPR). Manage personal information fields with the ability to erase data from primary tables as well as audit and archive tables. Mass update panels can now be dynamically defined using EditView layout engine. Only specified fields in the update panel will be used to update records. Layout engine will apply Role-based rules for fields that can or cannot be updated. When an imported field already exists, by ID, the values that are not specified in the import are retained (i.e. not set to null). Rules can be defined to automate the archival of module data that meets a specified criteria. The rules engine uses the same reporting scheduler to allow filtering by status and by date. Team-specific dashlets have been added to follow team rules as an alternative to My user dashlets. Team undelete support was added. Exchange synchronization now works with Office 365. Exchange synchronization now follows the team hierarchy security rules. 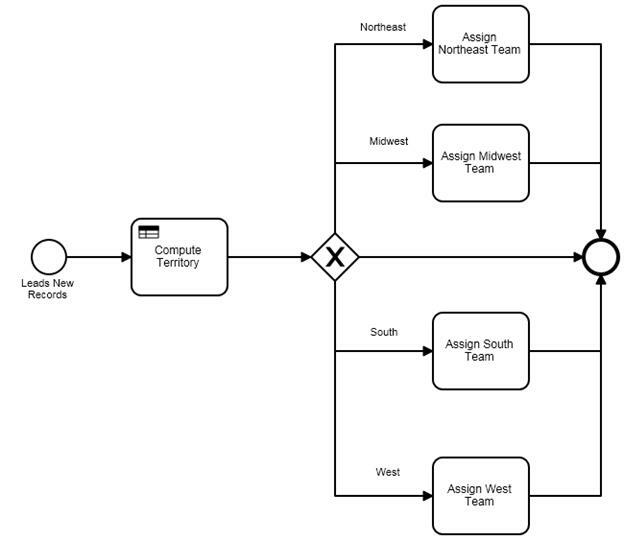 Reports generated by the workflow and BPMN engines can specify Excel as the render format. The records in the core modules can be archived to reduce the lists and increase performance. Dependent records get archived along with master records. Archived records can be easily searched using the same filters as unarchived data. Archived records can be easily recovered. Archival can be to separate tables in the same database or to a separate database. Accounts can be included in Campaigns. My Favorites dashlets can be added to the home page. Business rules can be applied to dynamic buttons. Import failures can be exported so that those failures can be fixed and re-imported. Multi-Select field can be stored as CSV or XML. The team hierarchy can be applied instead of or in addition to existing team management. The hierarchy tree is displayed on the left for quick access. My Team dashlets can be added to the home page. Records can now be assigned to multiple users. Dynamic assignments are appropriate when all users can see all records, but only owners have edit rights. Bi-directional synchronization of contacts or leads with Pardot®. Bi-directional synchronization of contacts or leads with MailChimp®. Synchronization of contacts or leads with IBM® Watson Campaign Automation. The HTML5 Client has been updated with to use a responsive design to better support phones and tablets. The Dashboard has been updated to support multiple layouts. The Home Page has been updated to support multiple layouts. Reminders can be set or sent when an incomplete task is near the due date. The full NAICS 6-code database is included. Multiple NAICS Codes can be assigned and searched per account. Calls, Meetings and Tasks can all be tagged for quick reference. Automatically import Exchange Inbox if they exist in CRM. Email alerts can easily be sent to accounts or contacts of Quotes, Orders and Invoices. The old MIME engine has been replaced with new open-source MailKit library in active development. Updated CKEditor to support latest browsers. GMail API is now supported directly instead of SMTP and IMAP. Microsoft Exchange Server API is used directly. Office 365 API is used directly. Active Directory Federation Services (ADFS) 4.0 is now supported. Azure Active Directory Authentication is now supported. Selection and filtering from the hierarchy has been enabled in all desktop themes. Search contents when enabled within SQL Server. Supported document types include Microsoft Office, PDF and many other popular types. Supports AND, OR, and NOT boolean operators. Generates Windows Workflow Foundation 4.5 Flowchart activity for maximum extensibility and reliability. Supports module update activities, email activities, delay timers and branching. Supports approval-type processes with manual or round-robin assignments. Extensible using custom C# activities as well as custom SQL procedures. Any user can create a tag and associate it with a record. Tags can be searched per module and globally. Administrators can manage the tags. Administrators can now set the primary role for a user. Administrators can now define the views to be used based on the primary role of the user. EditViews, DetailViews and ListViews can all have role-specific implementations. Integration with currencylayer to support 168 world currencies. On-demand currency updates or scheduled currency updates. Support for the Free Plan 1000/month as well as Basic and Professional plans. Activities from converted targets and leads automatically appear in contacts and accounts. Activities from contacts automatically appear in related accounts. New Parent-Child relationship can now be defined to create a hierarchy. Out-of-hierarchy teams can also be defined to allow exceptions. Dynamic Teams feature is support to further enhance team hierarchy. 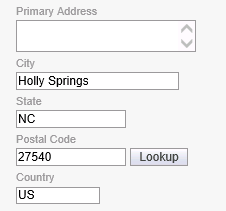 Build-in database of 43,000 US zip codes. Auto-complete and lookup search by zip code, city, state or country. Supports importing external postal code databases. 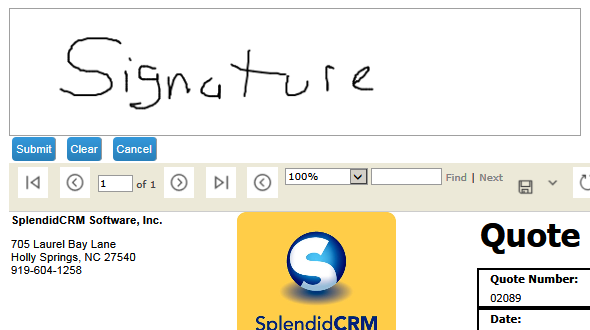 Acquire signature and embed into PDF for Quote, Order, Invoice or Contract. Touch support for signing with finger on tablet. Customer Portal support for customer signature acquisition. Quick lookup of all records relating to sender. Edit, view or archive email to the CRM. Create Account, Contact, Lead, Case or Opportunity with information from email. Outlook Web App and Outlook Windows client are both supported. Quickly create PDF attachments when composing an email. One central editor for Detail View, Edit View and Grid View layout management. Straight-forward drag-and-drop arrangement of fields. 100% HTML5 implementation for extremely fast response time. Background recompile allows better feedback of progress, including a progress bar. Ability to create multiple custom fields with automatic restart of recompile. Quotes, Orders and Invoices editing, including line-item managemnet. Accept credit card payments using the Authorize.net gateway. Authorize.net offers offordable, month-to-month pricing. View transactions and customer profiles. Enhanced support for mobile devices. Add support for Microsoft Report Builder 2016. Allow report button on Mass Update panel to report on selected items. Activity Streams provide quick access to detailed information regarding changes to a record. Users can post to the streams to add contextual information. The Seven theme adds a bit of color to provide quick visual clues to the type of module being referenced. A preview pane provides quick access to detailed information. Revenue line items provide a way to provide details to an opportunity. Contacts and appointments synchronization was updated to use the Google v3 API. Updated credit card charging to use latest PayPal API. Virtual Machine creation at various sizes. SQL Database creation at various performance levels. Software deployment including SSL certificate. Bi-directional synchronization of contacts or leads with HubSpot®. Bi-directional synchronization of contacts or leads with Marketo®. Bi-directional synchronization of contacts or leads with ConstantContact®. Single-direction synchronization of contacts or leads to iContact®. Bi-directional synchronization of Customers, Items, Estimates, Invoices and Payments with the QuickBooks Online system. New native synchronization engine that eliminates the neeed for a costly third-party library. On-premise customers get full source code to synchronization engine. New chat system that provides a quick way to communicate regarding related items. Messages can contain uploaded images, uploaded files or links to related items. A new mobile theme uses a more efficient menu system. The mobile layouts are used on smaller displays. Supports the new Chat Dashboard. The Mobile Client is a native app for the Anrdoid platform. The Mobile Client leverages all the features of the HTML5 Offline Client, but is faster as no effort is made to maintian offline data. Silverlight charts were replaced with HTML5 charts. A new Report Designer adds greater flexibility to reports that can be created from with SplendidCRM. The new Report Designer looks and feels similar to the Microsoft Report Builder query designer to minimize the learning curve. Field widths can now be specified in the designer. Column labels can be edited. Table relationships can be defined. Page width and height can be specified. The Offline Client is a native app for the Anrdoid platform. The Offline Client maintains a local SQLite database so that data can be collected and modified offline and synchronized later. As a native application, the Offline Client can store and manage large amounts of data, limited only by the memory of the device. New Business Rules access to Dynamic Buttons. Apply Business Rules to Unified Search panels. Allow Business Rules to hide entire EditView or DetailView panel. Duplicate records are checked as a record is saved, with the ability to ignore the duplicate warning. Concurrency checks can now be ignored in the same way that a duplicate record can be ignored. New Seven theme with preview and a collapsible dashboard on the core module list views. Allow SMS reminders for Calls and Meetings. Include SMS messages and Twitter messages in activities lists. Increased performance of Excel XLSX export. Teams field was added to Product Templates for better security management. A separate tax rate field was added to each line item for Quotes, Orders and Invoices. ASP.NET SignalR is a library that allows real-time bi-directional communications between web browser and web server. When possible, SignalR will use the HTML5 WebSocket transport, but will fallback to Long Polling, Server Send Events, or Forever Frames. Twilio is a service that allows Text messaging into an application. Text messages can be sent from the CRM through Twilio to any SMS enabled phone. Text messages can be received by the CRM and the message can be forward to the web browser in real-time using the SignalR library. Text messages are logged and tracked as an activity for an Account, Contact or Lead. Tweets can be sent directly from the CRM to Twitter. Tweets can be searched in real-time and imported into the CRM. 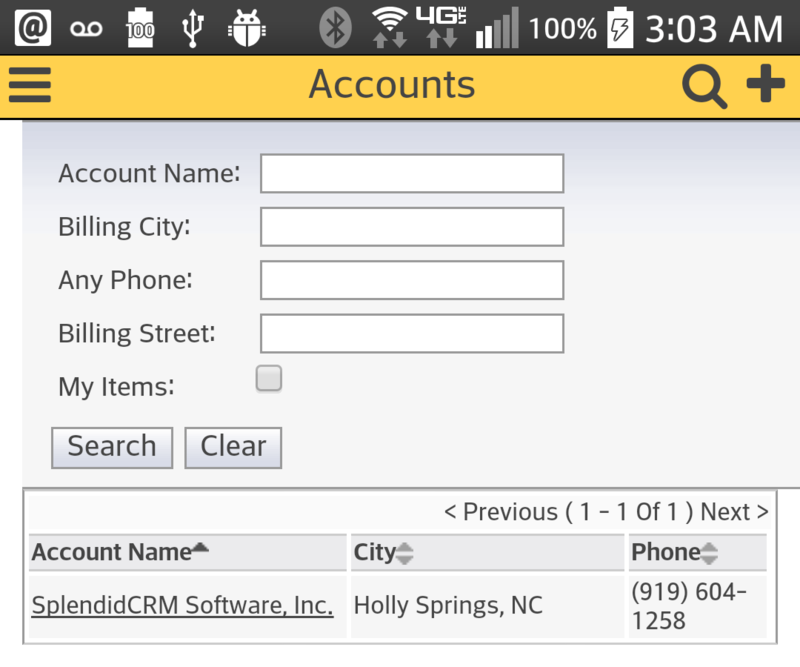 Multiple tracks can be defined and logged in the CRM. Tweets can be send in real-time to the web browser. Tweets can be associated with the appropriate Account, Contact or Lead. Asterisk is an open-source IP PBX. Outgoing Calls can be initiated from the CRM by clicking on an icon next to a phone number. Incoming Calls are monitored and a real-time popup is sent to the web browser for the CRM user of the phone extension. Incoming and outgoing Calls are saved and associated with the appropriate Account, Contact or Lead. PayTrace is a payment processing gateway that allows merchants to process Level II and Level III transactions. Use of Level II and Level III data allows transactions to qualify for the lowest possible processing rate. Deleted records can be undeleted in the admin panel. Deleted records can be search by name, module, date, user or audit token. User-selectable Email From allows email impersonation. Improved support for Microsoft SQL Azure. HTML5 drag-and-drop supported added to layout editors. Built-in support for Microsoft Translator and 38 languages. Create surveys with radio buttons, checkboxes, dropdown menus, text boxes. Create rating scales, matrixes and demographic questions. View live results from surveys. Quickly add a survey to an email and track responses by contact, lead or target. New calendar clearly displays events across many hours. Events can be dragged around calendar to change start time and enlarged to increase duration. Google holidays can be automatically added to the calendar. All day events can be created in the calendar. Events can be set to recurring daily, weekly, monthly or yearly. CRM recurring events can synchronize with recurring events in Google Calendar. CRM recurring events can synchronize with recurring events in Apple iCloud. CRM recurring events can synchronize with recurring events in Microsoft Exchange Server. Relationship sub panels now available on detail views. Multi-panel layout views have been combined into a single view with the help of the new separator layout type. Popup reminders are now supported for calls and meetings. Email reminders are now supported for calls and meetings. Campaigns have been enhanced to allow calls to be scheduled. Imported Contacts, Leads or Targets can be directly assigned to a Target List during import. 32-bit and 64-bit Installers now support Windows 8 and Windows Server 2012. All editions have been tested with SQL Server 2012. All editions have been tested with Visual Studio 2012. Email signatures can now be added to emails. Export to Excel is now in XLSX format. Last Activity added to top-level modules so that data can be more easily sorted by data. Speech input was added to all text fields for browsers that support speech input. Mobile theme now has a link to the full site for tablets that are recognized as mobile, but support the full site experience. Updated Microsoft Report Viewer to version 11. Added support for sub reports. CRM Accounts are bi-directionally synchronized with QuickBooks Customers. CRM Products are bi-directionally synchronized with QuickBooks Items. CRM Quotes are bi-directionally synchronized with QuickBooks Estimates. CRM Orders are bi-directionally synchronized with QuickBooks Sales Orders. CRM Invoices are bi-directionally synchronized with QuickBooks Invoices. Splendid Backup for Salesforce is a simple utility that will allow you to backup your Salesforce.com® database. This utility will backup the data to a local SQL Server database. The new theme has a more efficient menu with quick access of favorites. Facebook ® friends, Twitter ® followers and LinkedIn ® connections can all be imported. The new Spring.NET library is included to allow further integration with the related REST API. Salesforce.com ® data can be imported directly using a library designed to work with the Salesforce REST API. Forty-two standard reports have been added. Automatically import Exchange Sent Items if they exist in CRM. CRM Contacts are bi-directionally synchronized with iCloud Contacts. CRM Calls and Meetings bi-directionally synchronized with iCloud Calendar. The new REST API allows access to the data while preserving user security rules. Access to the dynamic layout data is provided so that the CRM UI can be faithfully rendered. The new offline client provides access to the data on tablets such as the iPad or the Android. The offline client can view, edit and create records while online or while offline without the need to install software. The new charting module provides a quick way to create column, bar, line and pie charts. Charts can be created online or created using the Microsoft Report Builder. HTML5 Charts leverage jQuery and jqPlot. 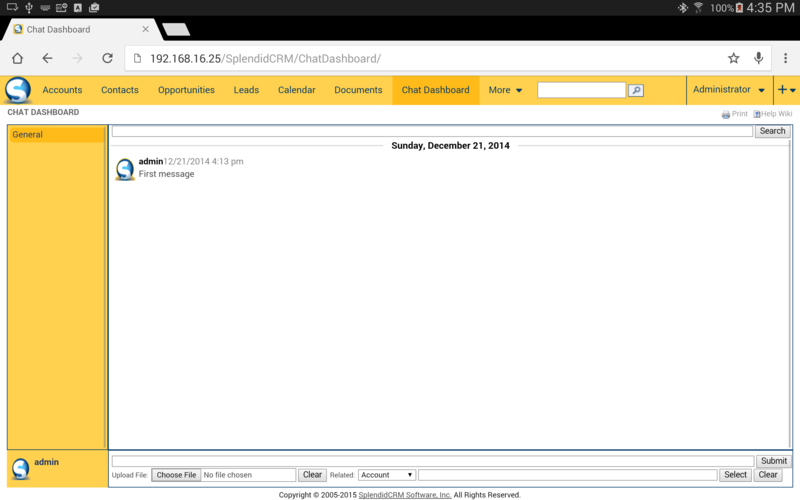 The new browser extensions make it easy to archive Gmail messages to SplendidCRM. The browser extensions allow account, contact or leads to be quick created in the CRM. Browser extensions created for Chrome, Firefox, Safari and Opera. Admin Impersonation is a useful tool for administrators as it allows them to see what a user sees. This is especially useful when advanced security rules are being applied. Enforcing password security is an important part of any application that requires authentication. SplendidCRM allows you to specify the complexity requirements of a password as well as the number of days before the password will expire. To prevent a hacker from trying all possible combinations, we have added a password lockout counter. SplendidCRM can be enabled to allow your users to login using facebook credentials. This can be used to increase adoption of the CRM by simplifying the login process. SplendidCRM supports Mail-Merge using a Word Plug-in. The plug-in is an important tool as it makes it easy to add CRM fields to a document. Once the document is formatted properly, the plug-in is used to upload the document to the CRM. Enabling Google Apps Synchronization makes it easy to ensure that all your users have the latest contact and appointment information at their fingertips. A new Rules Wizard provides a simple way to modify a collection of records within a module. Rules can be applied in an If-Then-Else construct using a simple programming language. A new Business Rules Engine allows an administrator to apply rules to EditView, DetailView GridView and layouts. The rules can be applied prior to the form rendering to initialize values and rules can be applied during the save operation to validate the field data. A new Report Rules Engine allows rules to be applied to reports prior to rendering to allow for calculated fields. Fields within a workflow can now include calculations and string manipulation using the syntax supported by the Rules Engine. Email Client - A POP3 and an IMAP Email Client has now been integrated into all editions. Configuration Wizards - An Administration wizard and a User wizard have been added to simplify setup. vCard Export - Contacts, Leads and Targets can how be exported as a vCard. Demo Data - The system can now be pre-populated with demo data to enhance the evaluation process. Checkbox List and Radio List - A checkbox list or a radio list can be used instead of a listbox. Searching Custom Fields - Custom fields can now be included in the unified search. Related Dropdowns - Dropdown lists can now be related to one-another so that only context-specific information is selectable by the user. GridView Information Icon - An informational hover icon can now be added to GridViews to provide more information in a small space. User Full Name - The Full Name of a user can now be displayed instead of the User Name. Drag-n-Drop - Drag-n-Drop was added to some of the lists to simplify customization of the system. All versions of SplendidCRM have been tested with Visual Studio 2010. The full AjaxControlToolkit has been linked to give the developer additional tools. The jQuery core is now included in the distribution. Added support for discounts in Quotes, Orders and Invoices. Added My Quotes, My Orders and My Invoices dashlets. Added support for multiple simultaneous Payment Gateways. Added Team Management to reports. Added support for Report Builder 3.0 and RDL 2010 report definitions. Workflow Alerts can now have template attachments and report attachments. Added support for custom workflow activities. Added a report scheduler that leverages the workflow engine. Inline Editing - When in a popup and searching for an Account, you can now create a new account without leaving the popup. When viewing the details of an Account, you can now create a new Contact without leaving the Account. AJAX AutoComplete - We have applied the industry standard approach of auto-complete to our search boxes and selection dialogs. Admin Delegation - Admin features can now be delegated to non-admin users to allow control over the administrative functions. SplendidCRM has been optimized to run on the Microsoft Windows Azure platform and the Microsoft SQL Azure database. Try out our demo at http://splendidcrm7.cloudapp.net. Use will/will to login. This server-to-server approach to synchronizing the CRM with Exchange Server 2007/2010 is the most efficient and easiest way to ensure that critical business emails get into the CRM. 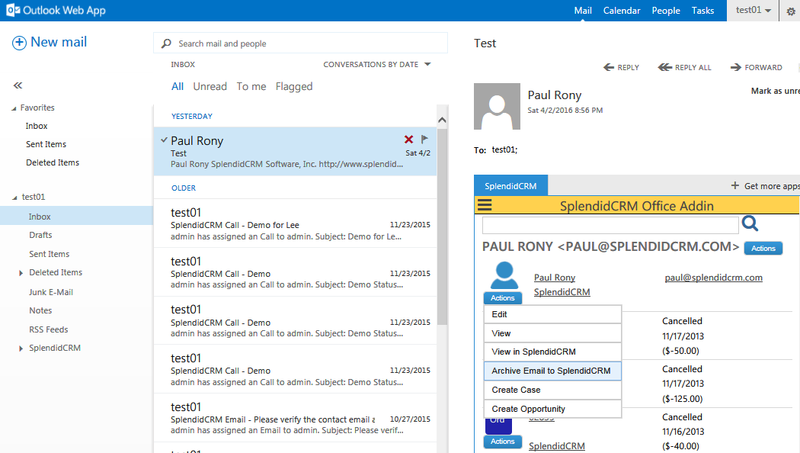 In addition to synchronizing contacts and appointments, SplendidCRM will create drop folders that simplify the process of archiving an email in the CRM. Reports can now be added as a Dashlet on the home page. Reports with embedded charts can also be included. To add a report to the home page, you simply click the Add As Dashlet link in the Reports List. One of our most requested Professional features is the ability to send a report as an attachment. This allows a Quote, Order or Invoice to be easily sent as an attachment to a contact in the CRM. A number of customers have requested that we make it easier to import data from ACT! 6. In this release, we allow you to import an entire ACT! 6 backup file and the CRM will import all the contacts, including the related notes and activities. Our Enterprise Edition now provides a Reporting Services interface to allow Microsoft Report Builder 2.0 to open reports directly from the CRM and save them back to the CRM. By integrating tightly with Microsoft Report Builder, we make it easy to create elaborate reports, even reports that have embedded charts. Some of our customers have requested the ability to hide specific fields from certain users. Field Level Security allows you to do just that. You can hide fields or make some fields read-only. Field Level Security is managed using the familiar Role facility. The new Dynamic Teams feature allows you to assign multiple teams to a single record. This feature is for those times when you want to have multiple teams have access to a shared account. One of our most requested features is the ability to create target lists using our report generation facility. This new feature allows you to specify an elaborate filter criteria that is automatically updated prior to running the campaign. The Offline Client is ideal for the mobile user. 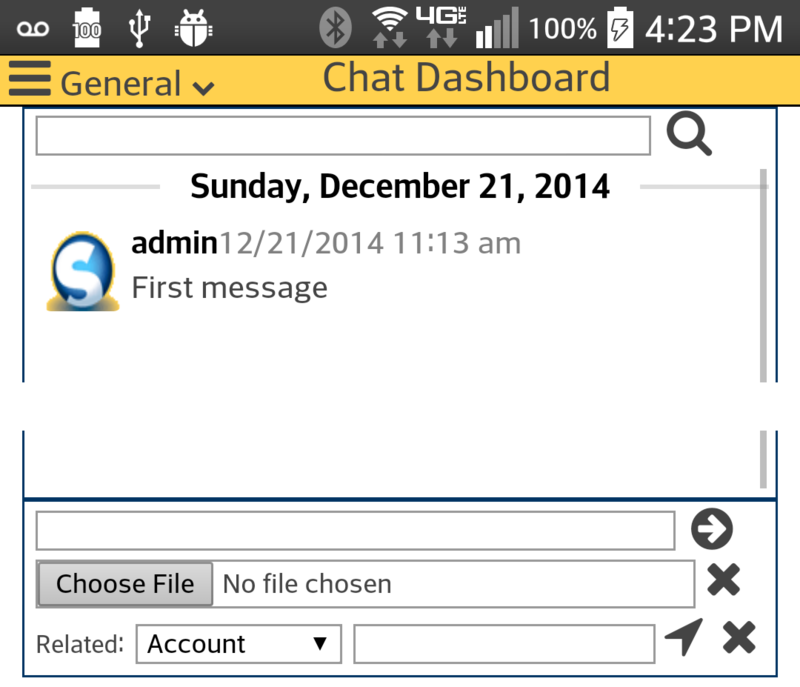 The Offline Client looks just like the server application, including all admin customizations. For security reasons, the Offline Client will only download and synchronize records that the specific mobile user has access to. We now include a Customer Portal application that will give your customer access to their case records. The Customer Portal is a slimmed-down CRM that is expected to be customer-facing. It provides access to bugs, cases and knowledgebase articles. Building a new module in SplendidCRM can be a time-consuming process, so we have created a Module Builder to make it quicker and easier. The Module Builder will create new tables, new SQL procedures and new web pages. The wizard-style interface will walk you through the process. 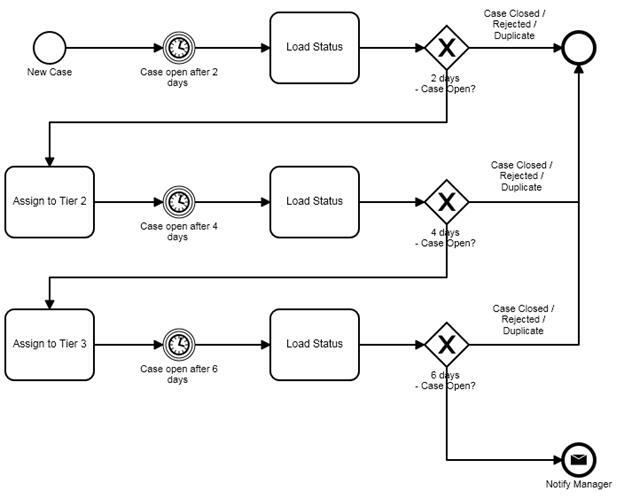 A SplendidCRM workflow is a series of actions or alerts that is triggered by an event. For example, when a potential customer submits a request on your web site, you may want to alert everyone on your sales team that they have a new prospect. And, one week later, you may want to email the customer to determine if their needs were satisfied. With Version 3.0, SplendidCRM is expanding its product line to include a Community Edition, a Full-Featured Edition, a Professional Edition and an Enterprise Edition. The Community Edition provides core CRM features to the community for free. The Full and Professional Editions add advanced CRM features, such as reporting and order management. The Enterprise Edition includes the advanced features and adds the workflow engine. SplendidCRM 2.1 is now available on the PostgreSQL database platform as well as on SUSE Linux using the Mono libraries. To see this new functionality, please visit http://postgresqlmono.splendidcrm.com. Campaign Emails with bounce handling allows you to keep in touch with your customers and track the ROI of a campaign. Inbound email allows automatic importing of email from a POP3 account, such as Gmail, with automatic linking to existing accounts, contacts, leads or prospects. Advanced Searching allows the use of searching operators <, <=, >, >=, !, != and = as well as date range searching. The new operators can be used in conjunction with the boolean AND, OR and NOT operators. Saved Searches allows you to save and recall named searches as well as the automatic saving of your last search in each module . Customizable Search dialogs allows you to customize the fields you search on using the same Metadata Drive User Interface (UI) that is used to edit the DetailViews and EditViews. Auditing tracks changes to all fields and allows viewing of the change log. Database backups ensure that you will not lose your critical information. Scheduler allows you to schedule campaigns and backups at virtually any frequency. Mobile Browser support enables you to access your data anywhere including on a PocketPC, SmartPhone, iPhone or Blackberry. Import SugarCRM language packs allows you to import the language packs available on SugarExchange, including Right-to-Left (RTL) languages. Import Report Definition Language (RDL) files allows you to create reports, including invoices, using Microsoft's Report Designer.